This week Canadian mobile device manufacturer Research in Motion (RIM) BlackBerry is throwing a big coming out party for its flagship BlackBerry 10 (BB10), the new operating system for the company's latest products. The past few years have not been kind to BlackBerry, but BB10 could change all of that. With six new devices set to come out this year and support from AT&T, Verizon Wireless and T-Mobile, should you be paying attention to the BlackBerry revival? Take a look at what's new in BB10 and tell us if these features get you excited. 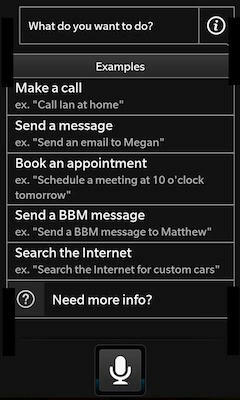 The last time RIM overhauled the BlackBerry interface, it didn't go so well. However, this time it looks like they got it right. Instead of trying to simply copy the competition, RIM designed an efficient, smooth system for better workflow. It allows for faster switching between apps and gives you relevant information up front. For instance, the calendar app will not only show you your appointment, but info about the person you're meeting with, past appointments with them, and recent emails between you. RIM calls this experience the BlackBerry Flow. Flow works because BlackBerry 10 handles multitasking better. It can handle nine apps at once and any others are frozen in the background, waiting for you until you need them again. You can also peek at your inbox from anywhere in the interface without having to switch completely to the email app. The truly universal inbox is often promised and rarely delivered. That streak may break with the BlackBerry Hub. This one app pulls in all of your messages, from emails and BB Messenger to system notifications and social networks (Facebook, Twitter, LinkedIn), plus more. This allows you to both read and answer/update from the same window. Most importantly, it gathers them together in a way that isn't messy or overwhelming. 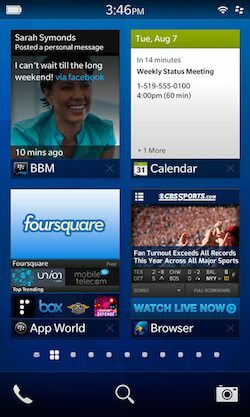 Many Blackberry users live and die by the Messenger, and in BB10 there are enhanced features that should appeal to more than just business types. Like the Hub, Messenger will now work with social networks. There are also rumors that BBM will include voice calls over Wi-Fi and video chat. BBM also supports video chat and an innovative Screen Share feature, which lets you share your entire screen with others. The physical keyboard is important to BlackBerry owners, but at least one of the devices coming out this year will be touchscreen only. 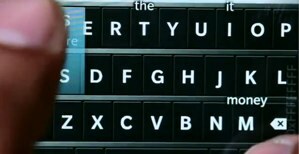 RIM wants to ensure that the typing experience is just as good. They developed an adaptive on-screen keyboard that learns from your typing and your messages to offer up word predictions (similar to Swiftkey for Android). The keyboard also includes some swiping gestures for better efficiency and learns where your typing center is, adjusting accordingly. We won't know the full extent of this feature until the launch event this week, but a leaked screenshot gave us a peek at some of the commands available. You can send an email or message, make an appointment, search the web and make a call, all with your voice. 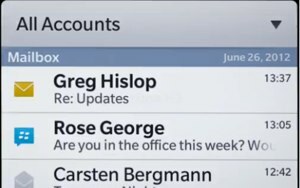 It looks like RIM is no longer trying to chase the mainstream market, but they do realize that people would like to use the same phone during work and after it, even if they don't want to do work-related things. BB10 has a dual-profile feature that allows you to separate business and personal on one device. That means different emails, social networks, apps, lock password and more. Bonus: the parental controls are more robust in this version, so you can pass your phone back to the kids without worrying they'll see or activate something they shouldn't. 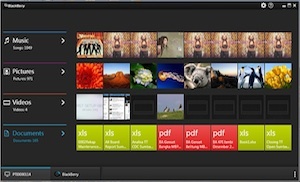 The desktop software for syncing and backing up the data on BlackBerry also gets an overhaul with BB10. More details will emerge at the launch event, but early screenshots show a well-designed, attractive and easy-to-use interface that makes syncing everything from documents to media simple and straightforward. Anything can look good on paper and in controlled demos, so we'll hold off final judgment until we've had some real-world time with a BlackBerry 10 device in our hands. If RIM BlackBerry can deliver on all of these features and has a few more up its sleeve, the prospects look good. If you want a phone that prioritizes communication and efficiency, a BlackBerry might just be the perfect one.